Signs supporting the Thompson Divide Coalition can be found throughout the area urging the BLM to cancel oil and gas leases in the area near Four Mile Park stretching south to McClure Pass. CARBONDALE — The Thompson Divide area west of Carbondale could be permanently protected from future oil and gas drilling under a new bill from U.S. Sen. Michael Bennet of Colorado. Bennet announced a package of four public land conservation bills Friday that preserves more than 400,000 acres, including protecting recreation and cattle grazing on 200,000 acres of the Thompson Divide area that stretches from just beyond the Four Mile Park area to McClure Pass. The Colorado Outdoor Recreation and Economy (CORE) Act “is the most significant public lands proposal I’ve ever introduced,” Bennet said on a press call with reporters Friday. Bennet has introduced bills for several years running, aimed at protecting the Thompson Divide specifically. A federal court last year confirmed a 2017 Bureau of Land Management decision to cancel 18 undeveloped natural gas leases in the region. And, the White River National Forest has removed much of the area from its available inventory of lands for new oil and gas leases over the next two decades. However, groups such as the Thompson Divide Coalition and Carbondale-based Wilderness Workshop have lobbied to have the area permanently protected from future oil and gas development. Carbondale rancher Bill Fales, who advised Bennet on part of the newest proposal, said protecting the summer grazing is critical to ranching in the area. “I’m a rancher who has relied for generations on summer grazing permits on Thompson Divide. Protecting these public lands is critical not only to me and the other ranchers, but to the entire community here. Recreation and hunting are vitally important to our local economy,” Fales said. 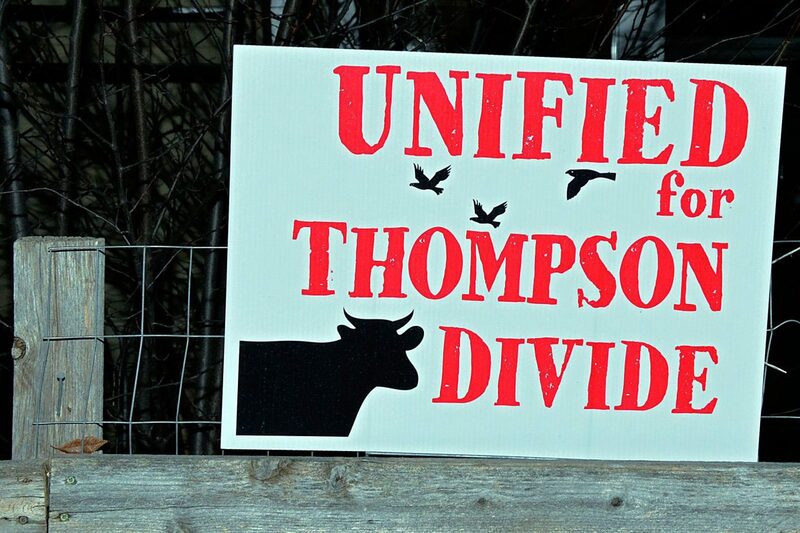 Fales praised the United for Thompson Divide Coalition for supporting a range of interests, from ranching to hunting and outdoor recreation, and contributing to nearly unanimous support for preserving the area. “There are some areas where the cost to the community outweigh any potential benefit of drilling, and Thompson Divide is surely one of those places,” Fales said. The bill sends a message that “what is on top of this land is much more valuable to us than any petroleum that might lie below it,” Fales said. In addition to the Thompson Divide bill, the CORE Act protects 61,000 acres in the San Juan Mountains, preserves 100,000 acres of wilderness, recreation, and conservation areas along the Continental Divide in the White River National Forest, and formally establishes the boundary for the Curecanti National Recreation Area near Gunnison. Angling group Trout Unlimited praised a portion of the Curecanti bill would open 26 miles of the Upper Gunnison River to class 1 public fishing easements. “Acquiring access easements to stream reaches in the Upper Gunnison will provide potential revenue for private property owners and help disperse anglers from high traffic areas allowing for balanced and long-lasting use of the resource,” said Jesse Kruthaupt, Trout Unlimited’s Upper Gunnison project specialist. The act would also designate Camp Hale, site the former Army base where the 10th Mountain Division trained to fight in Alpine conditions during World War II, as the nation’s first National Historic Landscape. The campsite between Vail and Leadville was crucial in launching Colorado’s outdoor tourism economy. Garett Reppenhagen of the Vet Voice Foundation said the drive to explore the Rocky Mountains helped him recover from the trauma of serving in the Iraq war. Bennet’s bill permanently withdraws 172,000 acres of the Thompson Divide from future oil and gas development, while maintaining private property rights for current leaseholders. The bill does not include language that will allow leaseholders to exchange their drill leases, Bennet said, but that could be added. The CORE Act will be officially introduced Monday, and the full text has not been released. Previous versions of the Thompson Divide protection bills “had some language that was of concern” for some oil and gas interests, Eric Carlson, executive director of the Western Slope Oil and Gas Coalition, said in an interview. The concern comes from what the legislation would do to existing leases that have gone through U.S. Forest Service or Bureau of Land Management environmental review processes, Carlson said. “It will be important to realize the impact of the legislation from the customer point of view,” Carlson said. The bill sets up permits for energy companies to recover methane from existing and abandoned coal mines that are on the Paonia side of the Thompson Divide. “I commend the senator for looking at that as a way to get energy,” Carlson said. “Colorado has waited too long for Congress to act on their earlier proposals, but the CORE Act presents a new opportunity to make real progress for our state,” Bennet said. “Colorado’s lands, air and water are at the heart of our state’s character, and they are at the heart of our state’s economy,” said Rep. Joe Neguse (D-02), who is cosponsoring the CORE Act in the House. “The areas protected in the CORE Act are a combination of cherished landscapes, wildlife habitats and recreational opportunities and we have a duty to preserve them all for later generations,” Neguse said. Previous bills that protect wilderness areas have been blocked, but with Democrats controlling the House of Representatives, Bennet hopes that the CORE Act could be broadly supported in Congress and signed by the president.